It has now been a year in my (not-so-new) job as a learning mentor in a school. It has been both mentally and physically draining. See post earlier this year. It's been tough and hard work but there has been a lot of reward (when I see my mentees improving and benefiting from the mentoring). I broke up from school early in 2016 (Friday 16th December). I know breaking up early means going back to school early but I was so ready for this break (as I'm sure all school staff are!). I feel as if I've been so busy trying to keep my head above water, that I'm really not prepared for Christmas. I did however manage to fit in some pre-Christmas cheer early last month. French Oven from Newcastle's famous Grainger Market invited me to their Christmas Night Market on the 1st December. I’m a huge fan of French Oven and the Grainger Market, so was excited to go to this late night shopping event. See previous French Oven post. French Oven kindly provided me with a VIP wristband. This allowed me access to the Grainger Market air raid shelter and other special offers during the event. 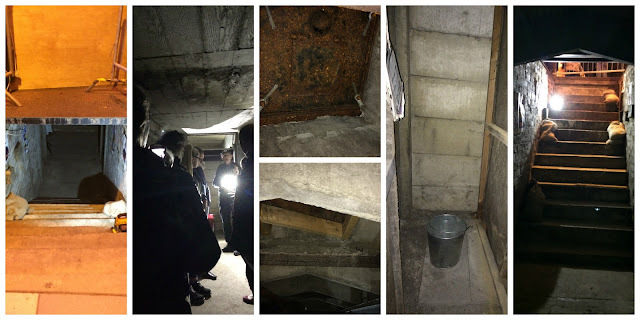 The air raid shelter tour was short and interesting. I recommend a visit if you ever get the opportunity. It adds so much to an already great institution. We were hungry so sought some food. Having tried Sloppy Joes Deli & Sandwich Bar (see review), Pizza by the Slice, La Petite Crêperie previously (all good by the way); I had two eateries that I wanted to try for the first time in mind. Well, three, but Lindsay’s To Go was closed that night. So, we ended up sharing some dumplings from Nan Bei and Turkish tapas from Fez Food. Nan Bei didn’t fare very well. The kitchen was very disorganised and ill-prepared for the event. You couldn’t order off the menu as you would expect. This left a limited dumpling filling option. And it was a massive wait; where we saw lots of people turn up, told what they wanted was unavailable, and walk away. When we finally got our dumplings, they were alright but don’t think I’ll be returning again. Nan Bei promised a lot (I’d seen good reviews) but we were disappointed. I hope Nan Bei sort out the system in the kitchen so they are able to turn out dumplings quicker. Or they streamline their menu so it is more manageable. The stress in the kitchen was evident and I really hope they improve and do well. The VIP wristband got us 20% off dumplings at Nan Bei. This was clearly marked at their unit, which we were happy about. Other places didn’t have clear signage; nor did people check if you had a wristband. This was a shame, as we felt uncomfortable and unsure all night. It was a bit of an inconvenience to keep asking whether the wristband was accepted or not. It would be good for future events here to make it clear where/who/what in the Grainger Market are taking part in the VIP wristband offers. Then you would really feel like a VIP and it would be worthwhile in purchasing the wristband. Fez Food had no VIP wristband offers. The owner, however was hospitable and gave us a free Turkish tea with each of our meals. I really recommend the Chicken platter; it was tasty and you get a lot of your money. However, the large mixed grill was too pricey for what it was; so wouldn’t get it again. The owner was so nice that he gave us free teas after our first one. I love the blend of their Turkish tea. Wish I could buy it myself and have it at home. 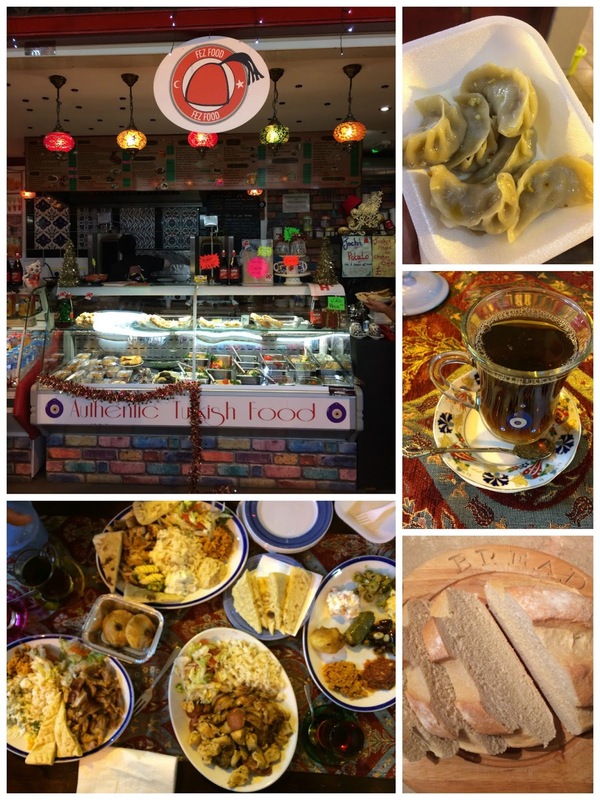 Ah well, It’s a good excuse to pop into town again to stop by Fez Food for some Turkish tea! The French Oven were taking part in the 20% discount with a wristband offer. I was only told this the second time I visited that night, and not the first when I had already bought something. Nonetheless, I bought white sourdough bread, Scotch pie and Empire biscuit from French Oven. The bread is top notch from there (see review). I always have to buy bread from here whenever I am in town near the Grainger Market. The pie and biscuit was for my husband. He couldn’t make the event, as he was working at his school’s Christmas fair that night. And it was his birthday too. Bless him; he did enjoy the pie and biscuit very much. So much so, I didn't even get a chance to take a photo at home. Overall, we enjoyed the Christmas night market at Grainger market and were chuffed to be part of this first event. I look forward to the next one, where I'm sure it'll be even bigger and better. Thank you for having us French Oven! N.B. French Oven provided me with two free VIP wristbands for myself +1 in return for tweeting and a review. We ended up having a Slice pizza which I wasn't too keen on! Fez food sounds good though..and I didn't even know about any wristband dicounts...ooops! I don't think any of the traders really realised how busy it was going to be. It was a huge shock to us at Pet Lamb, we were pretty ill prepared for the crowds that turned up too.